Rachel and Mike were married on March 9 with a ceremony at Wayfarers Chapel and a beautiful reception at Terranea Resort in Rancho Palos Verdes, California. 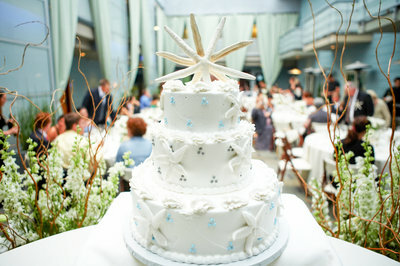 I was so happy to be the wedding photographer for their upscale LA Oceanfront wedding. I have to say, Rachel and Mike were the sweetest couple ever. Not only that, but they both went to the Art Center College of Design, so they both have a very keen eye for details. 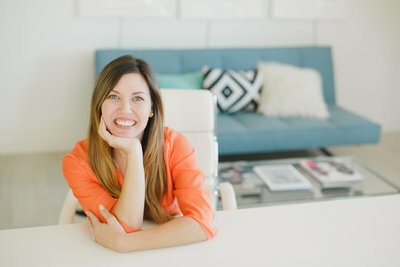 It was such an honor when Rachel shared that she and Mike were both very picky about their wedding photographer, and I was the only Southern California wedding photographer that they could agree on! So, needless to say, it definitely made me smile that these two creative souls appreciate my photography style! Speaking of art school, Rachel and Mike actually met in class! Even though they were in the curriculum with the same major for four years, they never once crossed paths until their very last class. Clearly, they were destined to meet, since they had both planned on dropping that class that quarter and ended up staying in the class. I am so glad these two found each other! Wayfarers Chapel is such a romantic place for a wedding. It’s an all glass sanctuary nestled in a picturesque grove of Redwood trees with an amazing view of the Pacific Ocean. Mike shared that he’d always admired the beautiful simplicity of Wayfarers Chapel. In fact, he learned about it when he was nine years old on a cartoon map and never forgot about it. It was a simply breathtaking ceremony location for their wedding ceremony. As the sun set, I stole the bride and groom – now husband and wife – down to the beach trail. It was such a beautiful day sandwiched in between many, many, unseasonably rainy days. We were so lucky for the beautiful weather and the gorgeous sunset. 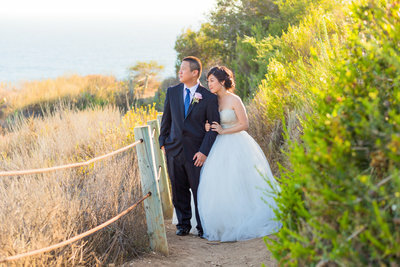 I loved walking up and down the trail overlooking the Pacific Ocean to capture pictures of these two happy lovebirds. Their joy was tangible. 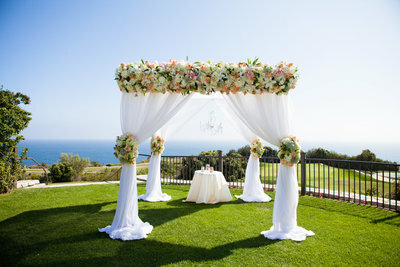 Rachel and Mike totally transformed Terranea for their wedding reception. It looked like a winter wonderland! It was carpeted in white, with stunning white florals and linens. It was truly stunning. Rachel shared that they decided on a Terranea wedding reception because of its proximity to their ceremony location and the unbelievable food. One of my most memorable moments of this wedding was their first dance as husband and wife. They danced to “Never in my Wildest Dreams” by Dan Auerbach with a fully choreographed dance number like something right out of a movie! Mike lifted Rachel up in the air and spun her around. Everyone was astonished. But here’s the funny thing. Sometimes our best laid plans go awry. Rachel confessed to me, after the wedding that they had completely messed up their routine. Even though they had practiced a million times, when the doors opened for their grand entrance…. They were late! The song had already started! So she and Mike just looked at each other, smiled, and ran with it. Rachel let Mike lead and they did all their favorite moves. She was shocked that no-one knew they’d botched the routine! That’s the beauty of weddings. Months of planning and still, on the wedding day, something will surprise you. I was just so happy that they were able to relax into it, trust each other, and make the best of it. I know that attitude will take them both far in their marriage, too! Mike and Rachel, thank you so much for asking me to be your wedding photographer. I was so happy to be a part of your very special wedding day. What beautiful and lovely photos are!! Love them!! I can see how happy Rachel and Mike are from every photos. Thank you so much for capturing these beautiful moments.